A PARISH priest in north Mayo claims he has been monitored by security personnel working for Shell at a location where work on the company’s controversial Corrib gas project is ongoing. The parish priest of Kilcommon, Fr Michael Nallen, alleged that his parishioners were “prisoners in their own area”, and that the registration of his car had been noted. In a poor English speech, one might start with "The Oxford dictionary defines 'courage' as..."
To see it in written work is even poorer, although it can be saved by an excellent follow-on paragraph. This did not, however, occur in a very poorly written piece by Fr Kevin Hegarty in The Mayo News this week. On the contrary, Fr Hegarty went on to add more of his usual vitriol to his vendetta against the Shell To Sea campaign. [Shell to Sea] Fr Kevin Hegarty is a member of Shell’s third-level scholarship board. It seems that he believes that "care of its landscape" includes supporting a 4.2metre tunnel through Sruwaddacon Estuary. 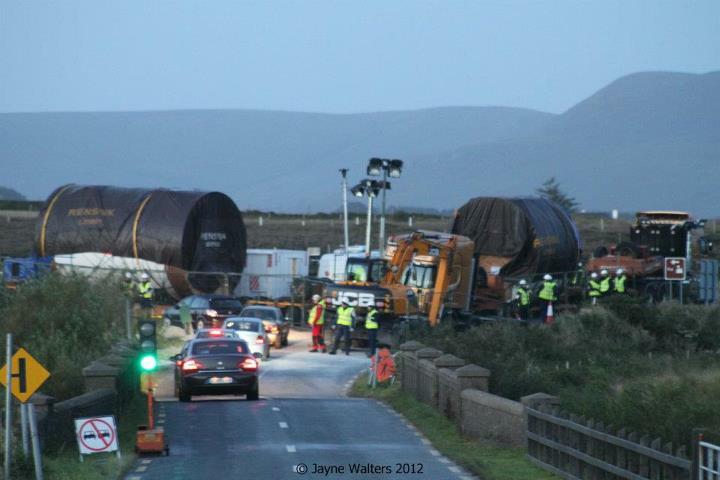 Last Week people travelled a 100 mile round trip from North Mayo to Áras an Chontae in Castlebar, by appointment, to view transport permits for the Corrib gas tunnelling convoy that travelled the country before becoming stuck on the Glenamoy crossroads. Arriving at Mayo County Council they were informed that the permit would not be available until Tuesday (today). When people with power in Mayo treat citizens, whom they have a duty to serve, in this way, they also do a disservice to their council colleagues who are committed public servants. This treatment is downright bad manners and promotes the power of authority over the power of service. What is to be gained from such treatment? Would a Shell executive or a Garda be treated in the same way? Why were local people treated so? MEMBERS OF THE Rossport solidarity camp at Aughoose in Mayo are seeking legal advice over a report that suggests a private security company has the camp under 24 hour surveillance. It is understood that a circulation from the security company which included information on numbers of people in the camp at different times and their movements was unintentionally forwarded to a non company email address. The Irish Times reported that the report had been sent to a group of 10 people, including two retired members of the Garda Siochána. THE COMPANY which provides security for the Corrib gas project in Co Mayo has said it is working “to the highest standards”. Integrated Risk Management Services (IRMS) was responding to disclosure of a company “situation report”, recording movements at a protest camp located on private land overlooking the Corrib gas pipeline worksite. The report by IRMS’s “Aughoose Command and Control Centre” comprises a timeline of movements on June 29th and 30th last, from 7am to 7am. OPPONENTS of the Corrib gas project in north Mayo are seeking legal advice on a communication recording 24-hour surveillance of a protestors' camp by a private security company. A prominent anti-Shell campaigner has appeared in court on charges relating to the latest protests against the Shell gas pipeline in Co Mayo. Maura Harrington, of Doohoma, Belmullet, appeared at yesterday’s vacation court sitting in Ballina on charges relating to two incidents on August 1st and 3rd last. She was charged with dangerous driving, failure to comply with the direction of gardaí and wilful obstruction on August 3rd last at Bellagelly South, Glenamoy. A few weeks after receiving the letter from An Bord Pleanála, Shell E&P Ireland engaged in excavation work at Glengad Beach, the proposed site of the pipeline landfall. Later that summer, this newspaper published remarks from Fianna Fáil Junior Minister Frank Fahey who claimed that a failure to grant planning permission for the Ballinaboy terminal would be "a most detrimental blow to the economic development of the north-west and Co Mayo in particular". A year earlier, Fahey, in his capacity as Minister for Marine and Natural Resources, had contacted Mayo Co Council to insist he be informed of the local authority's decision on the Corrib project before it was made public. Many people perceived the minister as exercising undue influence on a planning process that was supposed to be independent. Behind the Story. What do people do when the law prevents them from protecting themselves? Irish documentary filmmaker Risteard O'Domhnaill witnessed firsthand the ten year battle of a small Irish village that stood up to the Shell Oil Company. In an interview with CIR, O'Domhnaill details his experience of making the movie and how one has to go behind the reports put forth by mainstream Irish media to get to the real story.